"According to Town of Wakefield Polls and Estate Tax records of the 1890s, Rosson's Boat Livery was located at 19 Lowell Street at the head of the Lake. Although the 20-acre lakefront property was referred to as the Charles P. Rosson estate, the taxes were assessed to Emma Rosson. In 1895, the Rosson property included a dwelling house, 20 acres of land, 25 horses, cows and swine, barns and a shed. By 1899, the property list also included a boathouse and a shop. 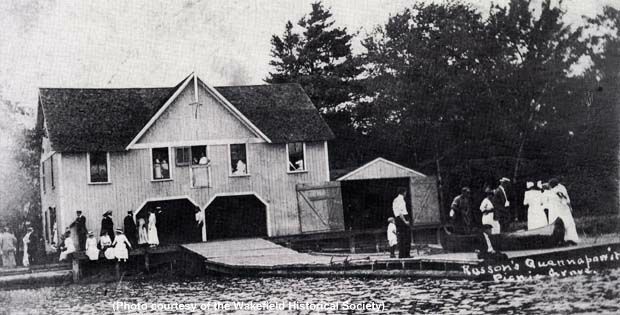 The boathouse and picnic grove hosted many community events including fireworks and a dance on July 3rd, 1900 to celebrate Independence Day. Canoes and rowboats were also 'at the disposal of the patrons.' An advertisement of the same time noted that C.P. Rosson's Quannapowitt Grove was open to the public for pleasure and picnic parties with boats and canoes for rent or sale. Also referred to as Rosson's Quannapowitt Picnic Grove, the property was near the Reading Citizens Ice House owned by E.E. Nichols and Son of Reading, an ice company that sold ice only to Reading residents. The icehouse was reported to be located where Col. Connelly Park now stands." -- Text from calendar by Jayne M. D'Onofrio. “Rosson's Quannapowitt Grove, circa 1899,” NOBLE Digital Heritage, accessed April 22, 2019, https://digitalheritage.noblenet.org/noble/items/show/7068.